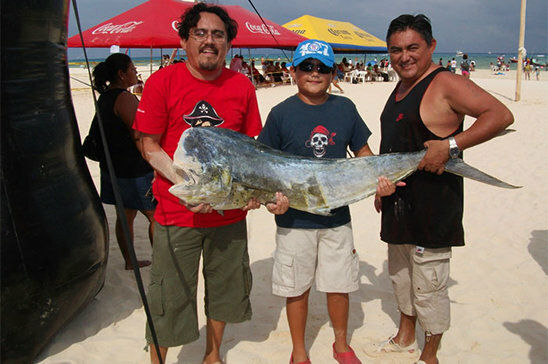 On May 31st and June 1st, Petit Lafitte took part on the 2010 edition of Playa del Carmen's, Day of the Navy Annual Fishing Tournament. On a 27' boat "La Valentina" kindly loaned by Alberto Baché and Jorge Fuentes, a team of 5 fishermen, captained by Felipe Fuentes and César Manrique, came in the top 20, out of around a hundred boats. 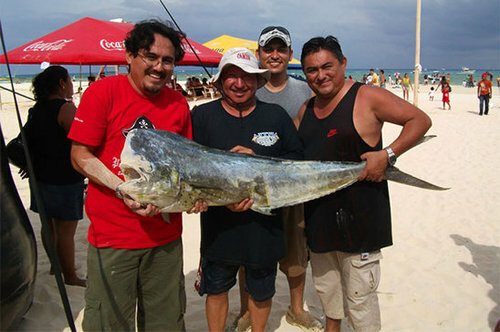 On the first day, they brought home 4 dorados, the biggest one a 35 pounder, shown in the pictures. 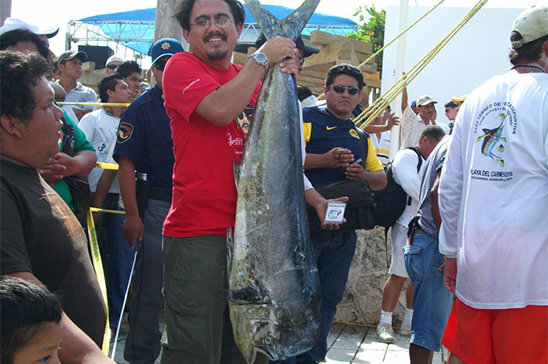 This dorado, took 4th place in the dorado catergory and placed Petit Lafitte on the 11th position of this tournament. On the second day, They caught a 12 pound barracuda, nice size, but definitely not competition material, unlike the White Marlin that got away… Other members of the team were César Prieto, Miguel and Iván Fuentes. The competition was won by the boat "Melissa," bringing a white marlins of around 180 punds. Other activities of the celebration included the traditional tug-o-war, the greased pole, a small market where some of the fish was cooked on the spot and served for free to the public and of course, beach soccer, beer…, beer… and beer. We are counting the days to next years event, and see what Petit Lafitte's team is made of.